People within 600 feet of a McDonald's can unlock a deal for a penny Whopper using the Burger King app. 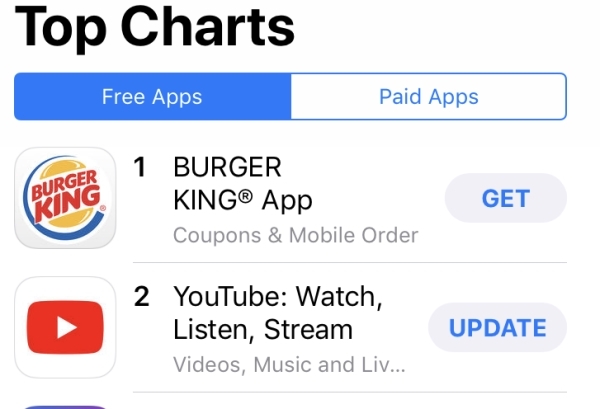 MIAMI: Burger King took the crown for top app in Apple’s App Store on Wednesday evening, following its #WhopperDetour activation. The fast-food chain kicked off its #WhopperDetour campaign on Monday to promote its "newly relaunched" Burger King App, which now offers order-ahead functionality. "Burger King is now number in the app store overall and the brand saw over one million app downloads in the first 24 hours of the campaign," Adrianna Lauricella, senior director of lifestyle at Alison Brod Marketing and Communications, told PRWeek. Alison Brod is handling PR for this campaign, and FCB is the creative agency. Burger King’s app was previously in ninth place in the iTunes App Store's food and drink category, the chain’s global CMO Fernando Machado told CNN Business. To get word out, Burger King posted some (purposefully) confusing tweets on Tuesday telling fans to go to McDonald’s. Burger King went into more detail in later tweets, explaining that, until December 12, when consumers go within 600 feet of a McDonald’s restaurant, they can order a Whopper for a penny through the Burger King app. The Whopper Detour geofences 14,000 McDonald’s locations across the country. If a consumer is inside one of these geofenced areas, the app will unlock the promotion. Once the Whopper order is placed, the user will be "detoured" away from McDonald’s, as the app navigates them to the nearest Burger King restaurant for pick-up, according to a release. The chain also published a video showing customers ordering whoppers from baffled McDonald’s staffers. On Wednesday, Burger King continued trolling McDonald’s on Twitter. Burger King’s App Store success is a direct consequence of the Whopper Detour campaign, Machado told PRWeek via email. "The engagement with this campaign has been incredible," he said. Burger King’s app has been downloaded more than two million times since the launch and more than 150,000 people have redeemed the Whopper for 1 cent, said Machado. "We are investing a lot in technology to improve guest services," he explained. "Our mobile app with order and payment is an example of that. And because we are Burger King, we advertise it in a fun, innovative and a bit of crazy way. Our fans love it. And the press also jumped on it because of the nature of the idea." This campaign was not an easy idea to bring to life, said Machado. "It took us a year in the making," he said. "In the end, we are getting better results than our expectations. And the expectations were high." In Q3, Burger King's U.S. comparable year-over-year sales fell 0.7%, while same-store U.S. sales increased 2.4% in the same quarter at McDonald's. Last week, Burger King tweeted gibberish, garnering 104,000 likes, 39,000 retweets, and 7,400 comments. Some speculated that a cat ran over the social media person’s keyboard, but it turned out the burger chain was promoting Cini Minis, the bite-sized cinnamon rolls the chain introduced in 1998 and discontinued in the 2000s. "You try typing with icing on your hands," Burger King explained in a later tweet. Editor's note: This story was updated with comment from Machado on December 6.